The last three and a half years or so have seen many events commemorating the centenary of The Great War and of battles and great events associated with it. The sheer weight of numbers means that many other actions and incidents that are worthy of recognition go without acknowledgement. One such event that is very dear to us here at Discovery Museum is the action which took place at Hervilly Wood on the Western Front on 22 March 1918, which led to the award of the Victoria Cross to a soldier of the 19th Hussars, one of the regiments that, in later years, would become The Light Dragoons. 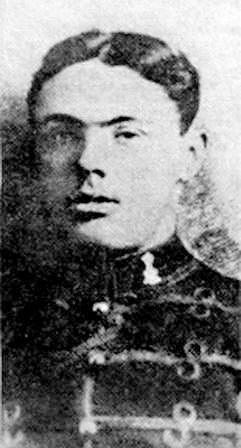 Herbert George Columbine was born in London on 28 November 1893 and wanted to become a soldier from the day in January 1900 that he saw his father depart to South Africa as a member of the Lincolnshire Regiment to fight in the Boer War. The death of his father in action at Silkaatsnek in July of that year seemed, if anything, to make him more determined than ever to join the army, no doubt to his mother’s dismay. Herbert and his mother moved from London to the pleasant Essex coastal resort of Walton-on-the-Naze when Herbert left school at 12. His resolve to join the army never wavered, however, and at the age of 17 he caught a train to Colchester and joined the 19th Hussars, probably because they had recently served in the area and he would have seen them. He would not be the first, or the last, young lad to be enticed by the elegant uniforms of the cavalry. The 19th Hussars were stationed at Aldershot when Herbert joined them and after basic training he became a machine-gunner, a fateful decision given the events of a few years later. When war was declared on 4 August 1914, Herbert was a soldier of some experience, at least in terms of training and service if not operational experience. The 19th Hussars mobilised as part of the British Expeditionary Force (BEF) and in less than three weeks were dug in at Mons awaiting the arrival of the German Army. He took part in the retreat from Mons, the Race to the Sea and the Second Battle of Ypres in May 1915. In an effort to improve the efficiency of their use of machine guns, which was some way below that of the German Army, the British decided, in 1915, to form the Machine Gun Corps (MGC). Regimental Machine Gun crews were transferred to the new Corps and in June 1916 Herbert was one of seventy men of the 19th Hussars compulsorily transferred to the MGC. By March 1918 Herbert had been in action on the Western Front for three and a half years apart from the odd brief period of leave and some training, and he must have been one of the few remaining from the original BEF. The Germans launched a desperate offensive designed to try and finish the war before the entry of the United States tipped the balance conclusively in favour of the Allies. The German attack was launched in the area of St Quentin by the biggest artillery bombardment ever seen and then at 9.35am half a million German soldiers advanced. By the following day all Allied reserves had been deployed to halt the attack. Herbert and his Squadron moved to a location just south of Hervilly, seven miles north-west of St Quentin. They had not been there long when the German infantry attacked and before long they threatened to overrun the position. Herbert and some comrades moved forward to take command of a machine gun post where the crew had been killed. As the attack continued and casualties mounted Herbert and his two remaining comrades became isolated from the rest of the squadron. Eventually, realising the hopelessness of their situation, Herbert urged his companions to ‘save yourselves, I’ll carry on’. He continued to repel attacks on his own until the Germans brought up air support and bombed his position. Herbert had held up the German advance for four hours and gave the retreating Allies time to regroup and consolidate their defensive positions. Herbert Columbine has no known grave. His name is commemorated on the Pozières Memorial, Panels 93 and 94. A memorial bust to Herbert was unveiled at Walton-on-the-Naze on Sunday 21 November 1920 and now stands in the Leisure Centre in Walton that bears his name. 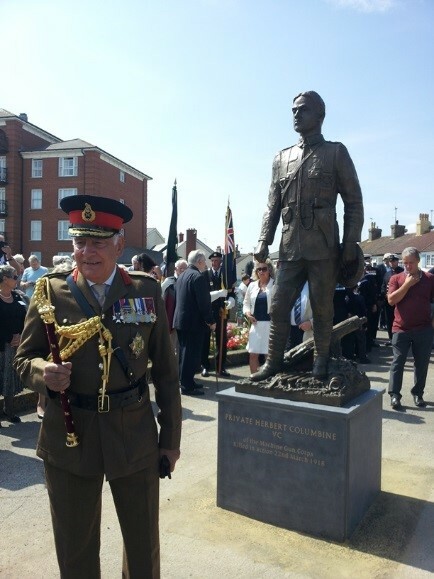 A statue funded by public subscription and with Dame Judi Dench as patron was erected on Walton sea front and unveiled by Field Marshal Lord Guthrie on 1 August 2014 with the Light Dragoons and the Band of The Royal Signals in attendance. His medals, including his Victoria Cross, are on display at the Essex Regiment Museum in Chelmsford. I am reminded of a quote about courage, although I can’t quite recall its origin. To paraphrase, it talks about types of courage, be it the red mist adrenalin-fuelled actions of an individual caught up in great events or the ice-cold calculations of an individual who is very aware of the situation, and of the danger to their life, but goes ahead anyway. Each are remarkable in their different ways and it would be crass to differentiate between the two. Herbert’s actions seems to me to be of the second type and it seems extraordinary to the vast majority of us who have never had to test ourselves in such situations that such courage can be displayed. In 1922 the 15th and the 19th Hussars amalgamated to form the 15th/19th The King’s Royal Hussars and adopted the motto ‘Merebimur’ which translates from Latin as ‘We shall be Worthy’. I can think of nothing more fitting than this for Herbert Columbine. I am indebted to the eminent author and military historian Carole McEntee-Taylor for permission to utilise the research and information contained in her outstanding book ‘Herbert Columbine VC’. The book is widely available in bookshops and through her website http://www.carolemctbooks.info/herbert-columbine-vc/ which also contains further information about the Herbert Columbine Statue project and the author’s other works.